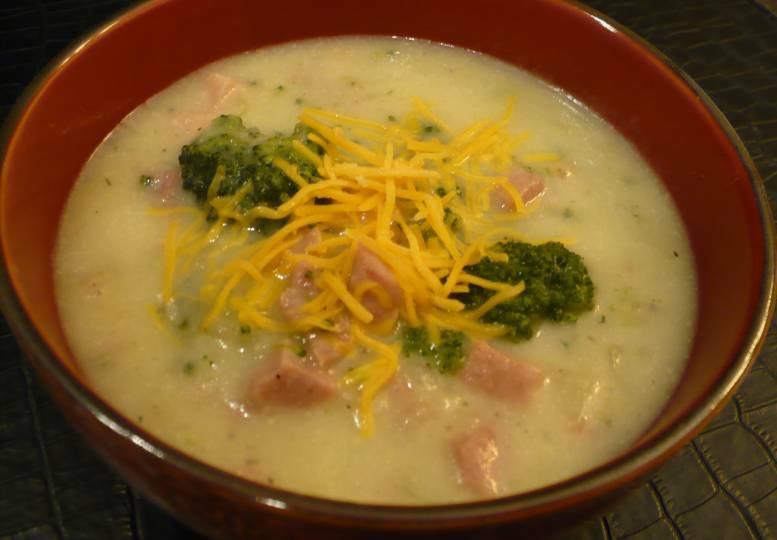 For day #20 of Soup Month we bring you a Creamy Broccoli Soup. This is a great soup to make after the holidays to use up leftover mashed potatoes and ham. This is a very versatile soup as well. You could change the vegetable to asparagus instead of the broccoli, you could stir cheese directly into the soup for a more cheesy flavor or add a can of diced green chilies with the onion for a little more southwestern flavor. Either way, this is a recipe for a fast and healthy dinner that's easy on the budget! In a medium soup pot heat olive oil over medium heat. Add ham and onion and saute until onions are softened, about 5 minutes. While this is cooking, cook the broccoli in the microwave and set aside. Add milk and chicken broth and broccoli to the pot, then slowly spoon the potatoes into the soup. Adjust the amount of potatoes depending on the desired soup thickness; 2 cups works great for a soup consistency and 2 1/2 cups of potatoes will result in more of a chowder. Add the black pepper, salt and white pepper and stir. ** Optional: If you still want the soup a bit thicker, combine the milk or cream and the cornstarch in a small bowl and slowly stir mixture into the soup, stirring constantly. Heat soup for 5 minutes, stirring to check the thickness. Serve in soup bowls with a sprinkle of grated cheddar cheese. Serves about 6.